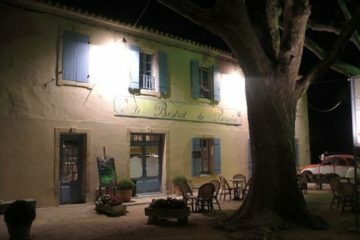 We were looking forward to eating here because Anne-Sophie Pic was the only female chef in France to crack the male-dominated French chef culture and be awarded three Michelin stars. (Plus she’s young – 39 – and petite, like me.) But we were also scared because when we looked up her tasting menu online the night before we visited, it said it was 395 euros.Per person. Now there was no way we were going to pay that, so we assumed we’d have to order a la carte – and hopefully the entrees (for which there were no prices online) didn’t start at something like 200 euros! So after heading south from Lyon to Avignon for the day (where, since it was Bastille day plus the Avignon Festival, it was busy and chaotic but fun), we drove an hour back up to Valence, another ugly, industrial, one-horse town with nothing much but Pic to recommend it. 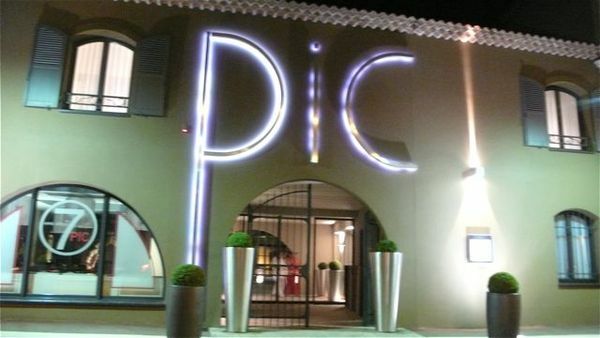 But then we stepped through the front doors of Pic, which was a sleek, modern oasis. Decorated in a country chic style with little birds as decorations on the lamps and massive purple puffball flowers on the tables, it was still more formal than we expected it to be (not sure why were still surprised by this, visiting one of the top restaurants in France and all). 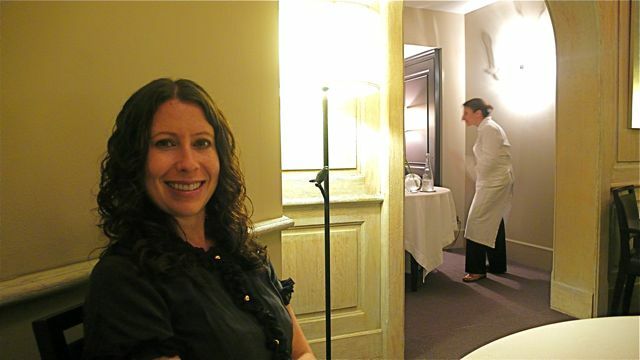 Luckily there were two tasting menus to choose from – the crazy expensive one, which apparently uses rare caviar in one of the dishes, and the still crazy expensive but-a-little-less-so one, at 195 euros. Considering some of the appetizers and entrees didn’t cost quite 200 euros each but were well north of 100, the tasting menu actually seemed like a better deal. 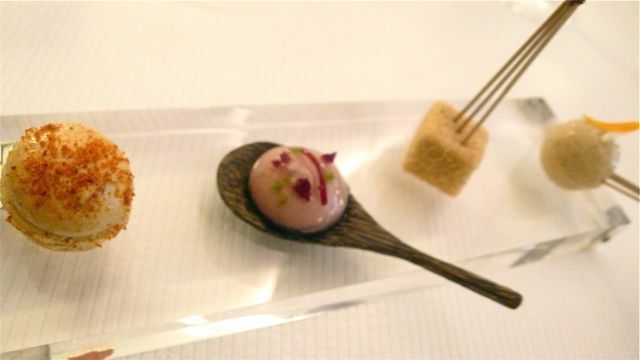 We started off with the amuse-bouches: a ball of vanilla-flavored foie gras, a cube of something that tasted like peanut butter, a spoonful of oyster and raspberry, and a mini “hamburger” of tomato in puff pastry. 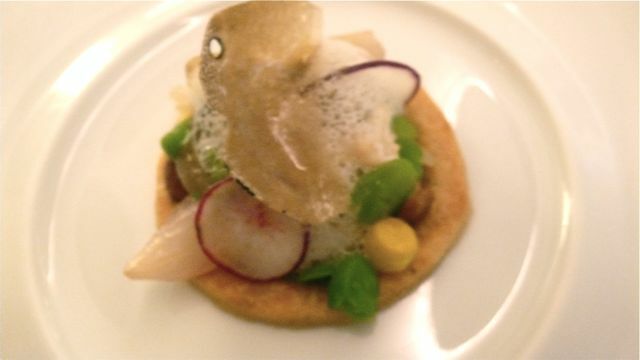 The foie gras and the oyster, in particular, stood out with their unusual yet well-balanced flavors. That’s when we started noticing that the pacing was a little off. Though we’d asked for a wine list, we hadn’t yet gotten one, and more food was starting to come: a foie gras mousse served in the style of a crème brulee, burned on top, and then topped with cream and a lone piece of popcorn, which seemed weird until we bit into the mixture and got a wonderful flavor of the foie gras mixed with the sweetness of the cream and the saltiness of that popcorn. 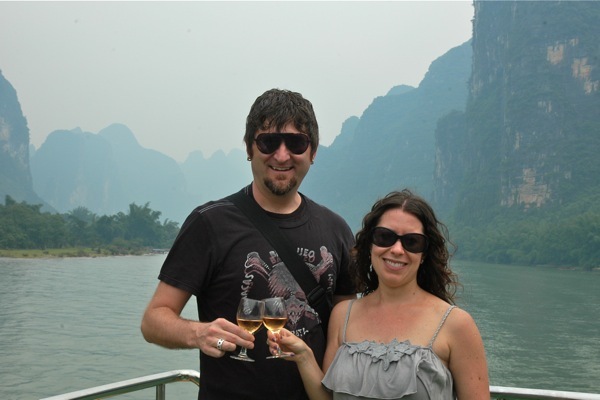 We were finally brought a wine list and decided to order two half-bottles so we could sample a couple of different local wines. We started with a half-bottle of a 2007 Domaine Bernard Griper St. Joseph from the upper Rhone, big and rich with a chocolate finish. While we were sipping, our next course arrived: a tomato biscuit topped with local vegetables and Parmesan cheese. This dish had a nice flavor and was well-balanced. Tomato biscuit topped with local vegetables and Parmesan cheese. Next we were served foie gras in a citron sauce topped with radishes. 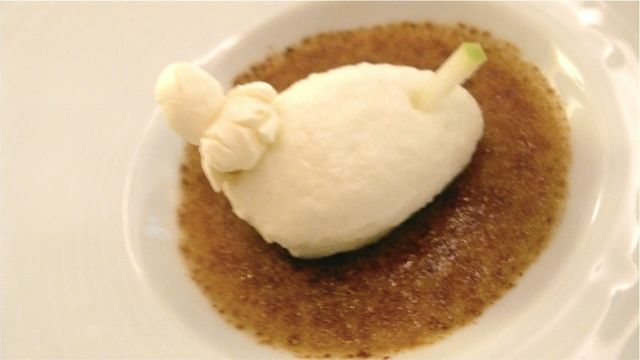 Though this foie gras wasn’t as rich as the others we’d had so far, it also wasn’t as smooth or melt-in-your-mouthy. 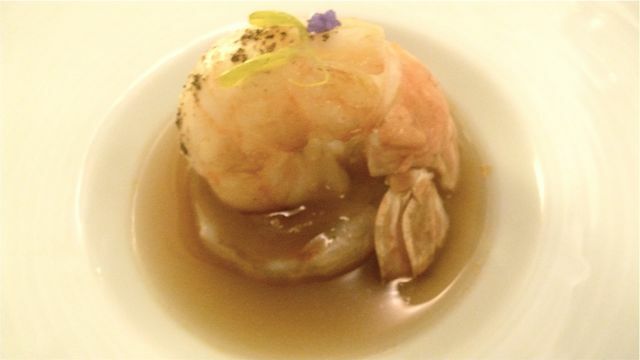 The next dish was langoustine on onion tartare flavored with lavender in a langoustine broth – very good, with an unusual but interesting lavender flavor. We were still noticing that the pacing was a little off and it was taking a really long time between courses to get our next dish. At least this gave us more time to digest! While we were waiting, one of our servers brought over our next half bottle, a 2005 Domaine Jamet Cote-Rotie from Jean-Paul and Jean-Luc Jamet. This was very peppery and earthy, and we both preferred the bigger first wine. 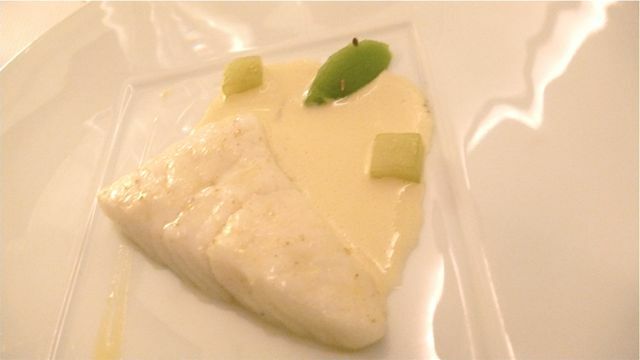 Next came the turbot with pickled cucumber and cucumber mousseline with anis vert sauce. First, I don’t like anise, which didn’t help matters, but second, both Jay and I found this dish uneventful. Next up was the ubiquitous (we were finding) pigeon dish. 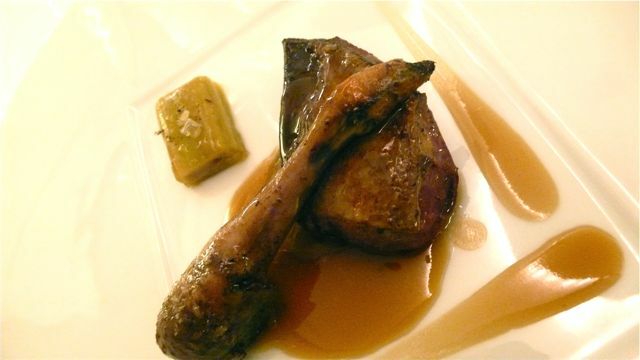 This one was flambéed in rum from Martinique and served with rhubarb and a jus of foie gras and pepper from Madagascar. Like the dish before it, Jay and found this one only ok. The pigeon was more gamey than the ones we’d had in the previous few days, and the flavors didn’t really wow us. There’s not much more to say about the cheese tray than to look at the pictures. 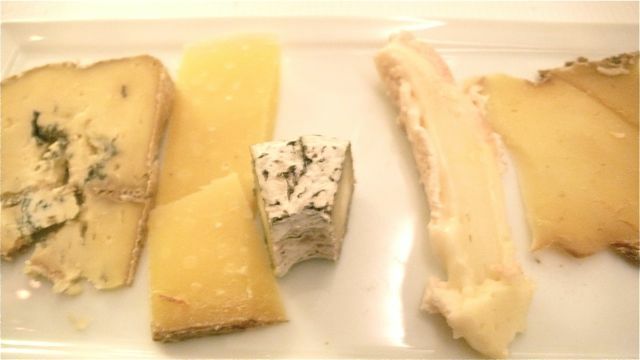 As at Troisgros, there must have been about 40 cheeses from all over France stuffed on there. (Trailed by a really, really stinky smell.) This time the server spoke English, so we had a little better idea of what we were choosing. I again chose three and Jay went for broke and got five this time out. The most exciting moment of the evening – food-wise or otherwise – was when the chef came out to introduce herself. We weren’t sure if she was really cooking that evening, so that was good confirmation. She also spoke a little English, so we were at least able to tell her she should really open a restaurant in NYC (though it seemed like she wasn’t seriously considering it!). Liz excited to see Anne-Sophie visiting with patrons. As it approached midnight, nearly four hours after we started our meal, it was time for dessert. 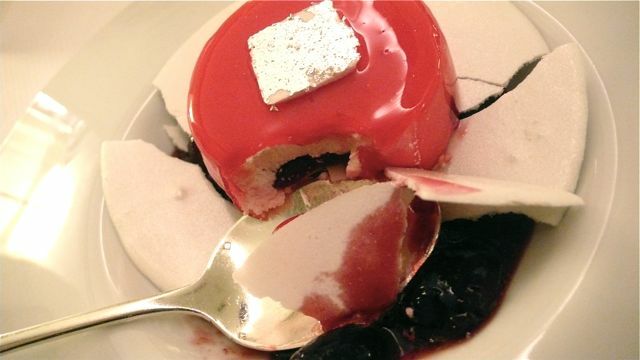 We started with a foam with bits of shortbread and fruit, followed by petits fours, and finally a cherry cake with white chocolate mousse, meringue, and elderflower sorbet – good, but very, very sweet. 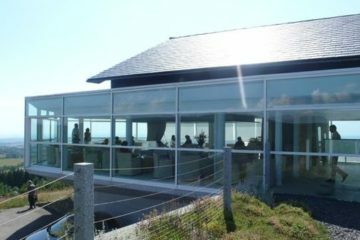 Open Lunch 12:30pm-4pm / Dinner 8pm-10pm; Closed Sunday Dinner & all Monday; Reservations Essential.